This layer provide support for rcirc with optional support for authinfo and ZNC. To use this configuration layer, add it to your ~/.spacemacs. You will need to add rcirc to the existing dotspacemacs-configuration-layers list in this file. You can store your servers configuration along with your credentials in the dotspacemacs/user-config of your dotfile. Important: This method is the less secured and it is not recommended since your dotfile is often stored in a public repository and is not crypted. This is convenient but not recommended. You can store your servers configuration along with your credentials in your dropbox in the file ~/Dropbox/emacs/pinit-rcirc.el. Important: This method is more secured since your file is stored in a private location but it is still not crypted on your drive. Moreover since Dropbox automatically sync your files you may have a lot of copies of the file containing your credentials. This is convenient but not recommended. This method is considered secured and is the recommended way to configure rcirc. This methods is also secured since it uses authinfo but you must secure your ZNC server configuration as well! ZNC is a popular bouncer which is easy to setup. A bouncer is a proxy that connects to your IRC channels on your behalf, instead of connecting to the IRC server you connect to your ZNC server. 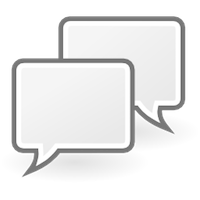 The ZNC server can store the discussions in a buffer while you are not connected. This assumes that you are familiar with ZNC and you have a ZNC server properly setup. If it is not the case then it is recommended to read about ZNC here. There is also an installation guide for Ubuntu here. For now authinfo is mandatory to use the ZNC configuration. Important port must be set to irc. This is a convention of the layer to retrieve the credentials for the ZNC configuration. Then setup your servers configuration using subdomains in the dotspacemacs/user-config function of your dotfile. The :auth keyword arguments will be replaced by the credentials stored in your ~/.authinfo.gpg. The rcirc documentation can be found here.